Hello everyone! For this post I'd like to show you another tape mani I did this weekend. I was wearing OPI Mrs. O'Leary's BBQ and the next day I wanted to spice it up, so this is what it became. It's not Sophy Robson's famous V-gap, but still a V-gap right? ;) It wasn't an easy choice finding a color other than black to suit the burgundy red of Mrs. O'Leary's BBQ, but then I remembered saying in a previous post how China Glaze Jitterbug just goes with any color, so this was my chance to prove it, haha. I think Mrs. O'Leary's BBQ looks really pretty with Jitterbug and that the whole design looks kind of editorial. I also mattified it to see what it would look like and I still haven't decided yet which version I like better... Help me out! Haha. I love it matte!! Reminds me of cruela devil. Don't know why. They both look gorgeous, but in this case i like the shiny one better :) Jitterbug is an awesome polish! I love the matte version, both look great though. The color combination is also fabulous ! Great color combo, I think I perfer the gloss look more. Jitterbug is a great color which I dont have it but it does look like OPI Lucerne-tainly Look Marvelous which I do have. wow I love this! Especially shiny! I now have these colors both on my wishlist! I love this mani (both original and matte)! Looks so elegant. 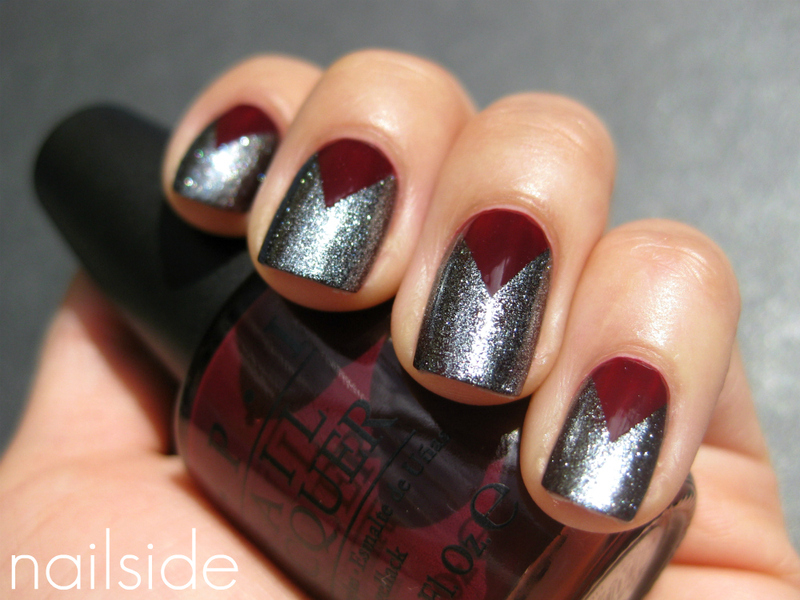 I love this mani =] I like both but mattified looks super stunning! Ooh, so pretty. I like the mattified one. Fantastic mani! I love it both shiny and matte, but perhaps a teensy bit more matte! The matte version is so so so pretty. Very...evil elegant? Beautiful. Love this. I know we are just entering summer, but I have been craving fall, vampy shades all week. This is right up my alley- and like you, I couldn't pick between glossy and matte! I think it looks best matte. It's definitely very pretty either way though! So pretty! I don't usually like matte, but I really like it in this mani. Even more so than the shiny (which is also very pretty). So pretty! I really like the shiny version, it looks so refined and evil at the same time. 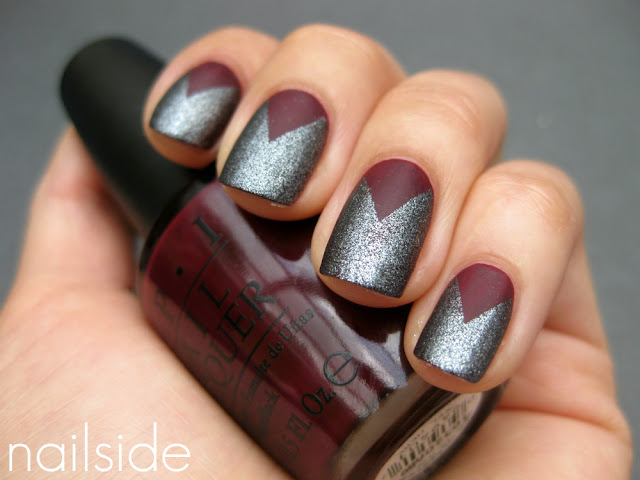 Ohh, I like this, very vampy :) I don't think I can pick matte or shiny lol. i like the matte one better! i like this V shape idea.! i should try this soon.! This mannie in matte is stunning and so vampy. Love it! Gorgeous! I love the matte version.